Mark Mangino is the last coach to post a winning career record at KU (50-48) and win a Bowl Championship Series-level bowl (Orange, 2008). KANSAS CITY, Mo. — The way Mark Mangino sees it, he’s going home. Again. "I’ve always thought the Big 12 is my kind of place," former Kansas coach and new Iowa State offensive coordinator Mark Mangino tells FOXSportsKansasCity.com. "And here I am, back in the Big 12." Mangino was officially announced Monday as an assistant with the Cyclones, whom he plans to visit Wednesday up in Ames. The ex-Jayhawks coach and Kansas State and Oklahoma assistant is back in the league he knows well after spending most of 2013 as recruiting coordinator/tight ends coach at Youngstown State, just across the border from his hometown of New Castle, Pa.
"I think there were a number of factors," says Mangino, a Youngstown State alum who coached the Jayhawks from 2002-09. "Certainly, I respect Paul (Rhoads, the Cyclones’ head coach) as a coach and a person. Having competed for a number of years against Iowa State, I knew that Paul is a very good coach and (ran) a very structured, disciplined organization. Iowa State kids are always hard-nosed, tough kids … and I’ve always appreciated how they play the game at Iowa State. "I’m looking forward to the challenge, and to get the ball moving up there." Cyclone fans hope to see that ball moving — literally. Iowa State ranked ninth in the Big 12 last fall in scoring offense, eighth in total offense, 10th in sacks allowed and 109th in the FBS in yards per play. But there are young tools to work with in quarterback Grant Rohach, running back Aaron Wimbley and wideout Quenton Bundrage, and Mangino’s track-record as a play-caller is nonpareil: While offensive coordinator for Oklahoma’s 2000 national champions, the Sooners ranked seventh nationally in score and 10th in passing — numbers that helped Mangino went the Broyles Award as the nation’s top college football assistant. "Yeah, you know, I’ve been asked that a bunch," says Mangino, the last coach to post a winning career record at KU (50-48) and win a Bowl Championship Series-level bowl (Orange, 2008). "I’ll be honest with you: When you’ve been to as many places in the Big 12 as I have … I’ve coached against a lot of friends and a lot of people that I admire, and good people at all different places. "As a coach, I don’t believe that you treat any game differently. They’re all important in college football, so you prepare the same way — for a coach, emotions shouldn’t be a factor in your preparation … you have to get your players ready to play and compete, no matter what the circumstances are. "So I’m not going to make a big deal about Kansas or Kansas State or Oklahoma. I’ve coached against all those schools before. I’ve coached against coaches I’ve worked with and have friendships with. So you can’t get all hung up on that business; it’s about having your players ready to compete, no matter where the game is, or who it’s against. I’m not going to get all into that. "Been there, done that. Several times." Mangino, 57, remains the only coach to win back-to-back bowl games in Lawrence and the only one along Mount Oread to win three separate postseason contests. Meanwhile, the Jayhawks have posted a record of 9-39 since his 2009 departure and have gone through two football administrations and two athletic directors along the way. "I haven’t really focused on it during my time away from there," Mangino says. "I’d like for (the Jayhawks) to win; I would hope that they would’ve won more games. I can’t say that I’ve been really focused or locked in on it. I’ve moved on. "I’ll tell you what I’ve told my players for years: ‘You can’t change history, whether it’s good or bad. You live for today, you’re mindful of the future.’ That’s the way I approach coaching and that’s the way I approach life." 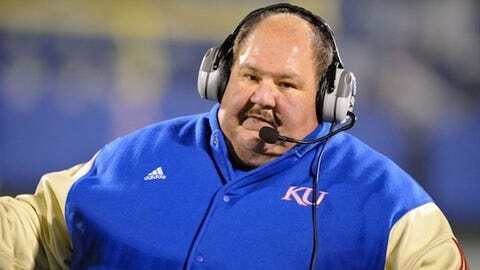 To that end, Mangino has lost more than 120 pounds since his Kansas days. The move gets him closer to his kids, too — son Tommy is a graduate assistant with the Arkansas Razorbacks, and there are grandkids to chase in Oklahoma. After a scare two years ago, he says wife Mary Jane, as of December, is cancer-free. And maybe ready to have him out of the house more often. "She’s like, ‘You know what … you’re going up to the Big 12, back into the Big 12, you’ll probably work longer hours, just do a good job. I’ll be here at home, sitting here with the dog, watching TV,’" Mangino chuckles. "So much for matrimony after 35 years. Can’t live with you, can’t live without you." The Jayhawks sure as heck haven’t lived that well without him. His record in Lawrence has looked more and more distinguished, given the benefit of hindsight, and the success of friends and peers such as Dan McCarney — the former Iowa State coach who just hoisted North Texas out of football purgatory — hasn’t discouraged his dream of returning to a head job. Someday. "We’ll see," Mangino says. "You never know. I think right now, I really want to zero in and lock in on one thing: To make Iowa State’s offense better."